In this day and age where food has become a technical art, and new appliances designed to make life easier enter the market every day, the best slow cooker brands have remained some of the most popular and trusted cooking aids of all time. A product so simple that it allows you to place all the ingredients in a pot and leave it to cook and develop flavors for hours is one that, especially these days, speaks to people with little time on their hands. 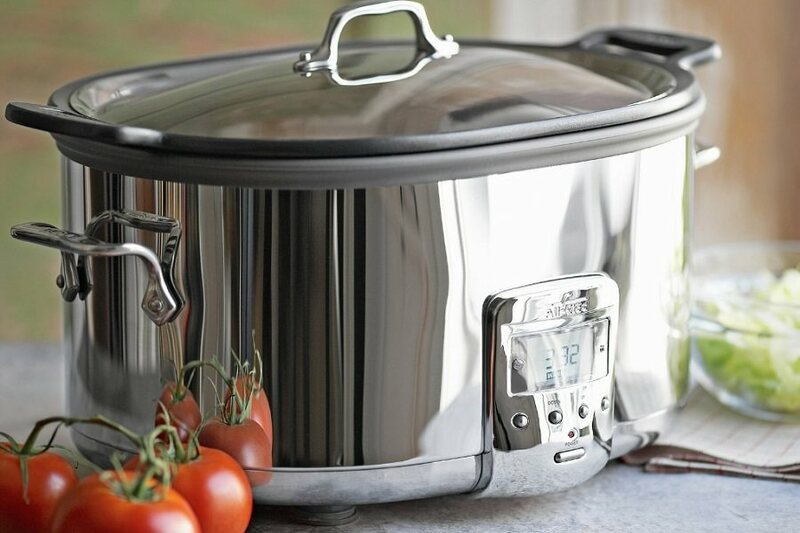 Finding the best rated slow cooker for your home will depend on a few factors, including how often you use it, what recipes you’re cooking with it, and how much of an automatic function you want it to have. Once you own one, though, there’s no limit to the amazing recipes you can create. Soups, stews, pasta, roasts, casseroles, and even salads, the options are as wide as your imagination. 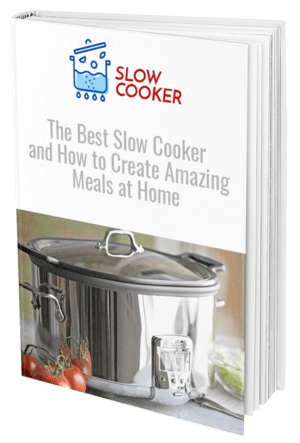 Slow cooking has developed with modern times to now offer a myriad of recipes available at the click of a mouse that helps to get the very best use out of this amazing appliance. 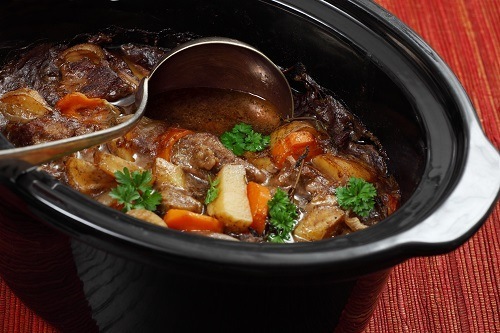 Slow cookers work using a slow and gradual method of simmering food, which is set at a lower temperature when compared to other styles of cooking. They work by distributing an equal amount of heat throughout the pot to aid in a gradual but thorough cooking process. These cookers are generally round or oval-shaped and have a lid for covering, made from stoneware and surrounded by metal or another electrical heating element. This metal helps to deliver heat evenly throughout the pot to cook your food slowly and carefully. Due to this longer process of cooking, slow cookers and crock pots are ideal for meals that involve little preparation which can then be left to simmer away throughout the day before being ready to eat at dinner time. The best slow cookers are those that feature varying temperature settings, generally low, high, or warm, to allow you to adjust these according to cooking times. Once the food is ready, you can set it to warm so that it doesn’t lose any heat or freshness during serving. There are many good reasons why slow cookers have maintained their popularity over the years, even with modern times and a range of new kitchen appliances being introduced constantly. A slow cooker is a fuss-free and simple way to create flavorsome meals, and save yourself a lot of time and effort in the process, but there’s much more to it than that. The number one benefit of using a slow cooker is the small amount of meal preparation you have to do. The best slow cooker meals follow a simple recipe which has you do some preparation at the start of the day, place the ingredients into the pot, and then leave it to cook for eight hours or so before serving. 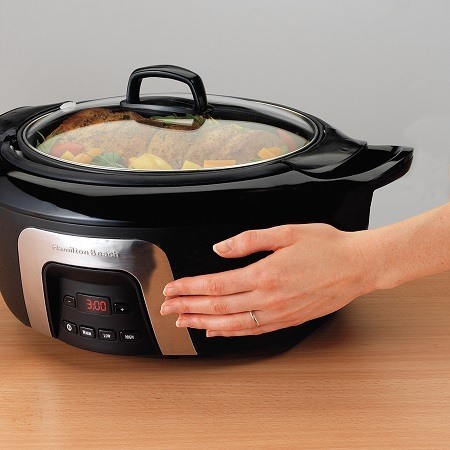 Slow cookers are known for their dual purposes, as both a cooking pot and a heat reservoir. Once your meal has finished cooking, you can simply switch the setting to warm and have it keep your food fresh and hot for as long as you need. This makes them ideal for parties or dinner events where you don’t want to serve up cold dishes. It’s not just in your head, using a slow cooker actually helps to enhance flavors and there’s scientific evidence to back it up. Particularly when cooking meats, the slow cooking process helps to liquefy the collagen in the tissue and create a silkier and more tender texture to your recipe. 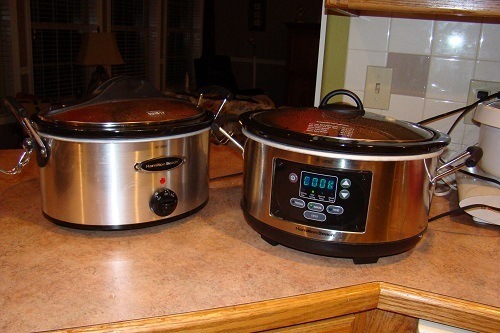 Most slow cookers and crock pots come in at around 4 to 6 quarts, so they can make enough to feed quite a large group. This also makes them ideal for single cooking too as you can prepare a meal in advance and freeze portions for those days when you don’t feel like doing any work. Having a slow cooker in your kitchen means you have a one-stop-shop to create just about any recipe. Desserts, dips, soups, stews, pasta, and more, there is no limit to how creative you can get with this amazing appliance. Keeping a slow cooker clean is a simple process, and as most of them are made from a stoneware insert you can simply pop them in the dishwasher or do a quick scrub in the sink. For those who don’t like to wash up, you can purchase crock pot liners to insert before cooking so you simply throw the plastic bag away when done and put your slow cooker back in the cupboard. For those who know someone with a slow cooker, you’ll know that they’ve had it in their home for many years. 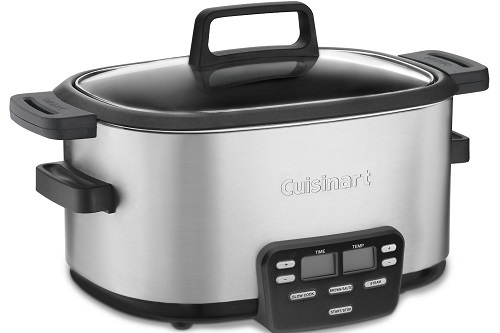 The best crock pot and slow cookers will last quite some time, provided you find a quality brand. For the cost of most reputable types, they are an amazing investment for your kitchen. Many people use the words crock pot and slow cooker interchangeably, and while it’s true they are very similar there is actually a slight difference in the two. Crock Pot is one of the original and best rated crock pot brands available, but it’s also a slow cooker. However, all slow cookers are not Crock Pots, unless of course, they fall under the brand name. According to an article in Huffington Post, the crock pot design came historically from the 1930s where a Jewish mother used a pot to cook bean stew all day long before Sabbath. The brand was born here, and from then on many variations of slow cookers were made. Modern crock pots and slow cookers have been designed to take even more effort out of the cooking process, with the ability to let automatic heat sensors do most of the work. However, the original design of the slow cooker is still used to apply the even and gradual heat to the pot. Although the crock pot is actually part of a registered brand name, it’s similar to how Kleenex is used widely to describe a tissue. Just because you are speaking of a crock pot, it can also relate to any number of brands of slow cookers. The basic premise for slow cookers remains the same through the best slow cooker brand names, using the gradual and evenly distributed cooking method to achieve its rich flavors. However, there are a few different variations to be found. Depending on your needs as a home chef, you may find some features more useful than others. For those who live alone or are more into making desserts, dips, and other small recipes, a small slow cooker is ideal. The best small slow cooker should be easy to clean and not take up much bench space, so look for one that can offer this as well as quality cooking power. Many people prefer to use their crock pot for larger meals, whether they’re sharing with others or not. A large slow cooker can be great for families, dinner parties, or even to cook extra servings for yourself and freeze them for a later date. An automatic crock pot will take the guesswork out of temperatures for you, and provide a fully automated cooking experience. These work usually by cooking high at first, and then lowering the temperature when required to get the best flavors and consistency out of your ingredients. Although it may sound like work, a manual slow cooker is still the style you can set and forget. Manual slow cookers require the chef to select a temperature setting, according to the recipe, and can adjust it as required throughout the cooking process. A multicooker is a relatively new product on the market, compared to crock pots, and they have the ability to do everything a slow cooker can, and more. These machines will also steam, boil, grill, roast, and deep fry your food so they offer a little more versatility than a crock pot. The best crock pot would likely belong to the brand name who started it all, Crock Pot. This brand has developed a whole range of new models, though, so don’t expect them all to be as basic as their first model. Now that you know all of the different types, you may be asking yourself what is the best slow cooker? While it’s true purchasing a crock pot will depend on a few personal needs, there are things which indicate a better quality product, and the best rated slow cooker should always feature these. Crock pots and slow cookers shouldn’t require a lot of maintenance, provided you care for them correctly. The best slow cooker brands will be easy to keep clean without doing damage, though. Many these days are dishwasher friendly, which can be a huge help for busy families or dinner parties. The best crockpot will be able to prove it in their construction, and offer a solid warranty period for the consumer. Slow cookers should be made to last, so you want to ensure you’re purchasing the best quality one with a long warranty available. Most crock pots are made from stoneware with a stainless steel casing, and these materials are what you should look for in the best slow cooker. Not only is stoneware easy to keep clean, but it will last your kitchen for many years without sustaining much damage. Although this is a personal choice, there’s no denying the effortless charm of an automatic slow cooker. While some may like to use manual settings, it can give peace of mind to know your crock pot is doing all of the hard work for you and keeping an eye on your food when you cannot. 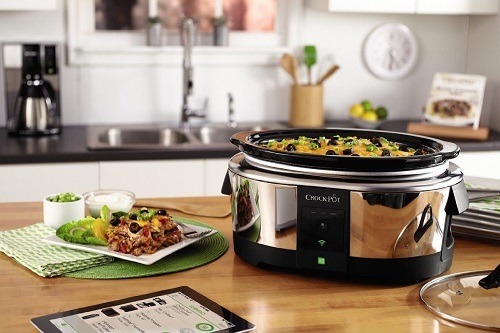 Find online reviews to see what the best rated crock pot is, and always go with a trusted brand. Many slow cooker manufacturers have been creating these appliances for years and have a good reputation behind them. Once you’ve found the best slow cooker for your needs, the fun can begin. 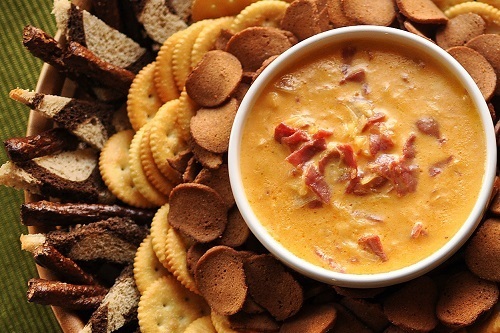 The most amazing thing that you’ll find when using a crockpot is the wide variety of recipes that you can create with just the single appliance. If you’re having a party or dinner event, slow cookers are perfect for getting your meal preparation sorted early. Simply spend some time in the morning preparing, and then forget about the meal as you get the rest of the party sorted. Whether you’re having a party and want to make dips and desserts or are looking to create an authentic foreign feast, the slow cooker is your new best friend in the kitchen. With so many amazing recipes available, you won’t know where to begin. 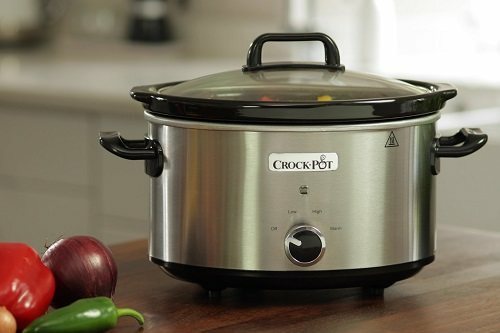 Some of the best crock pot meals to serve at a party are appetizers, and this appliance is ideal for creating a whole range of recipes. For those times when you want something more filling, your slow cooker is great for keeping meals hot and fresh until they’re ready to serve. Whether you want to dish up hot dips and cheese fresh from the slow cooker or prepare them earlier, this ingenious appliance will help to get the very best flavors to impress your guests. With so many appetizers available to be cooked in your slow cooker, you won’t know where to start. Meatballs, chicken wings, and a range of other side dishes can be easily whipped up with your crockpot and served piping hot. For something a little different at your next event, why not try for a theme and let your slow cooker take care of the rest? Mexican nights, barbecues, or Asian cuisine, there’s a theme to suit every party. Using your crockpot for family meals is a great way to save time when you have a busy schedule. Many people like to prepare their dinners in the morning before work, and let the slow cooker take care of the rest throughout the day. When it’s time to eat, simply dish your meals straight from the pot. What better way to help the meat fall straight off the bone than to use your slow cooker. You can prepare a full roast in the pot and help keep the juices and tenderness contained. One of the simplest uses for your slow cooker is to create delicious pasta sauces. Simply set and forget to let the sauce simmer all day, and then throw your pasta in at the end for a fuss-free meal. Whether you’re in the mood for Chinese, Mexican, Italian, or Indian, a slow cooker is an ideal way to prepare these delicious feasts. Experiment with different flavors until you find one that will rival any authentic overseas cuisine. The best crock pot recipes for staying healthy are generally loaded full of vegetables and lean meat, letting this amazing appliance help to bring out their very best flavors. Whether you’re on a strict diet or simply trying to lower calories for your health, cooking a large batch of something nutritious and freezing single portions is the easiest way to ensure you stay on track. 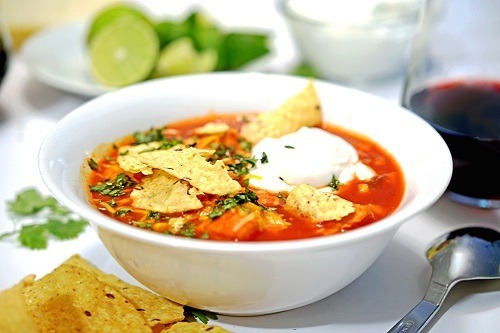 The ultimate healthy meal, creating soups with your slow cooker is the best way to get flavors from these nutritious ingredients. If you don’t have a recipe, simply throw your favorite vegetables in with a bit of broth, and you’ll be amazed at the taste you can create. For something with a little more substance that soup, why not whip up a healthy casserole. Packed full of vegetables, herbs, and meat, these classic recipes also freeze well for a rainy day. Who says your crockpot has to be all savory? This kitchen appliance is ideal for making a range of desserts, served hot or cold, and you can even prepare some a day in advance for big events. If you’re looking to add a bit of excitement to dessert time, why not turn your slow cooker into a fondue machine? Fill it with chocolate, cheeses, or anything you desire for a fun twist on after dinner treats. You might not know it, but slow cookers are great for cooking moist and delicious cakes. Used just like an oven, you can cook a cake on a more gradual heat to help bring out flavors and reduce the chance of dryness. 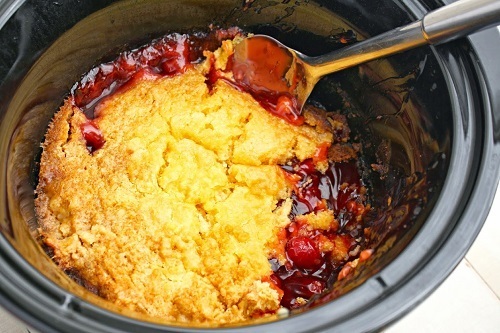 Mix together biscuits and sweet sugar with a range of fruits in your slow cooker to create a warm and mouthwatering cobbler. Once done, serve with ice cream or whipped cream for extra decadence. There isn’t much to these kitchen appliances, but a little care, when using and cleaning them, will go a long way. Most of the general care relates to its heat, so as long as you are careful not to leave it on long once you’re done cooking, you will be taking care of it well. Never turn your slow cooker on to pre-heat as you would with other cooking methods. Once all of the ingredients are inside the pot, it’s okay to turn it on. Patience is key with slow cookers, so you should never try to rush the process. When it comes time to clean your crockpot, there’s no need to use any harsh chemicals or cleaning agents. The stoneware construction of a slow cooker makes it relatively easy to clean, even when you have cooked on stains inside. For those times when you can’t simply scrub the stains out, try soaking it with some household items such as white vinegar and baking soda, and letting the heat of the apparatus do the work for you. The heat will help to further soak these stains, making them easier to remove later on. There are many reasons why slow cookers and crock pots are found in many American households still to this day, and will continue to be a popular appliance for years to come. In this day and age where we care more about the quality of foods we are eating but have less time to prepare something nutritious, the slow cooker has never been more useful. Preparing meals in your slow cooker is not only easy to do, but the flavors that you can achieve with this gradual process will rival any cooking method you may have tried before. The steady heat helps to break down ingredients to create a silky texture that will melt in your mouth with each bite. While there are many great brands on the market, finding a slow cooker that suits your personal needs but doesn’t sacrifice in quality is essential. Whether you want a small or large pot, automatic settings, or something more classic, the best crock pot to buy is one from a reputable brand. Once you make a meal in a slow cooker, there’ll be no turning back. Whether it’s the versatility, minimal effort, or full and rich flavors you can create, you’ll be hooked on this revolutionary style of cooking and what it can mean for mealtime at your house.